Summer is here and it’s time to let our students shine. We’re giving them reign over our studio to indulge their creative urges. You’re invited too! Join us for a week of thrills including student exhibitions, jewellery demonstrations, family workshops and more. To coincide with Camberwell Arts Week we’re highlighting our brilliant jewellery students at work. We open our doors for you to see them in action. Watch them work their magic to transform raw materials into delightful objects of beauty! You can also see their amazing jewellery in the displays around the studio. 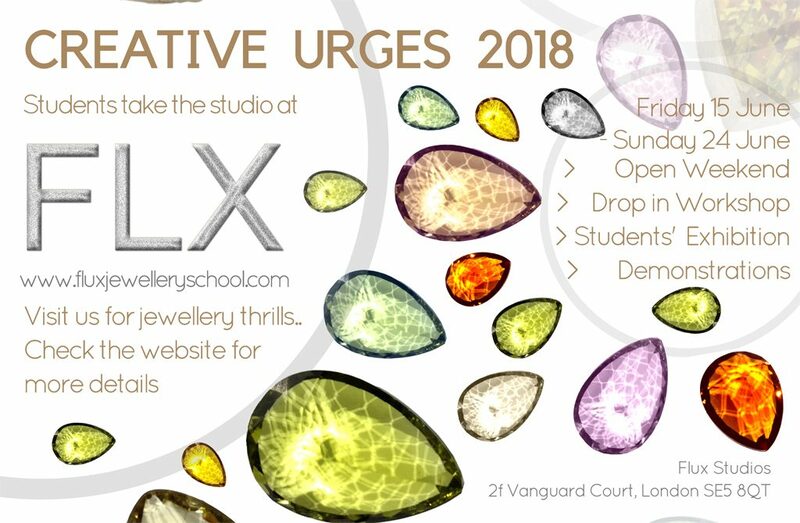 Jewellery demonstrations by our students at Flux. Drop by to say hello. If you need more details about any of the events, or advice about planning your visit please email us. Tagged Camberwell Arts Festival, Creative urges, Exhibitions, SALS, Southwark, Vanguard Court Open Studios, Workshops. Bookmark the permalink.